Bo Anderson, an eighth-grader at Clarkston Junior High School, qualified and competed for Waza Track Club in three events for the AAU National Junior Olympic Outdoor Track and Field Champions, held July 30-Aug. 6. He competed in the javelin, 1,500-meter run and the 3,000-meter run at Renaissance High School in Detroit in July to qualify for the Nationals. He traveled to Texas in August with nine other athletes from the WAZA track team to compete. “It was an exciting meet,” Kathy said. 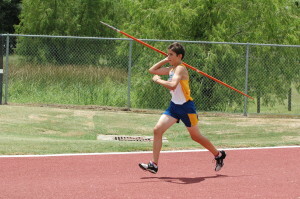 The highlight of Bo’s competition in Texas was the javelin throw, which Kathy added is a unique competition for an athlete his age. He beat his personal best by over eleven feet, and finished in 22nd place in the nation with a throw of 86 feet- 8 inches. “His coach was really happy about his throws and thinks it’s amazing to watch an athlete of Bo’s smaller size compete against much bigger, stronger 13-year-olds, and throw as well as he does because he is able to engage his whole body and stick to the fundamentals and technique of the javelin throw to get the distance,” said Kathy. Bo wasn’t not far from running personal best times in his 1,500-meter and 3,000-meter runs. “It was very hot in Houston, and our athletes really had to focus on adjusting for the heat and humidity,” Kathy said. Bo was only five seconds away from his personal best time in the 1,500-meter, 5:14.45), and nine seconds off of his best in the 3,000-meter, 11:36.98. Bo competes with Waza Track Club and has competed with the club since 2012 in outdoor track and field, indoor track and field, and cross country. He has qualified to compete in USATF and AAU National Junior Olympic events in all three formats, and has traveled to competitions in Kansas, Texas, Ohio, Iowa, Virginia, and Alabama. 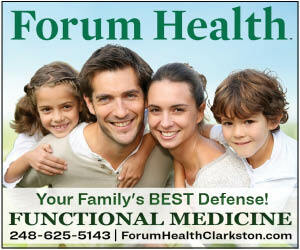 Bo’s parents are Mike and Kathy Anderson of Clarkston.